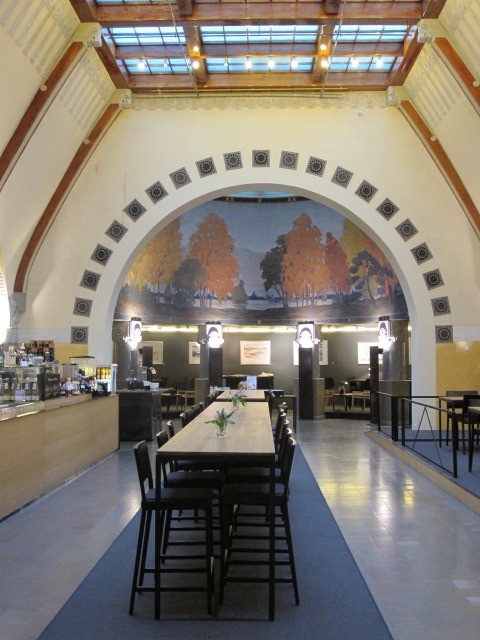 Ashcan Cafe Jugend is set in a beautiful Art Nouveau building at Pohjoisesplanadi 19, beside the Information Centre. The building was originally built in 2 phases between 1815 and 1827 for Russian born merchant Yegor Uschakoffin for residential and commercial use. 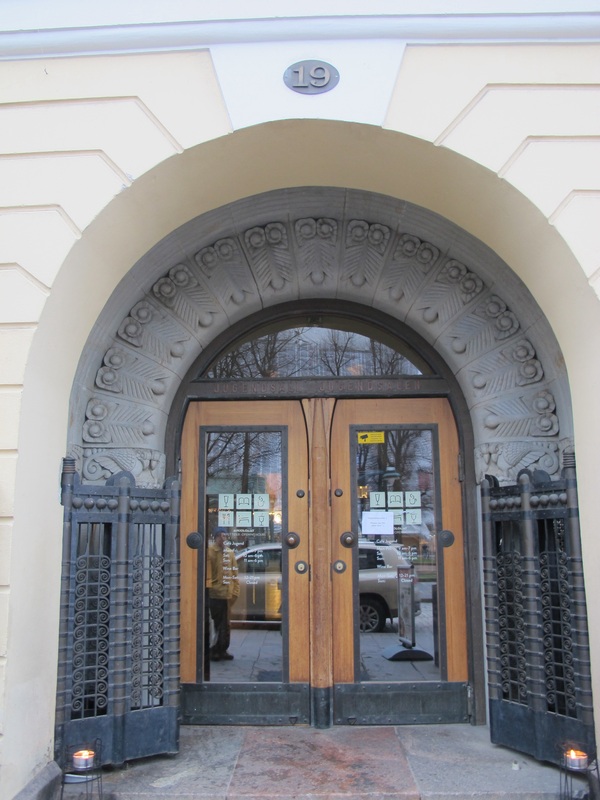 In 1904 it was renovated by architect Lars Sonck as a bank. 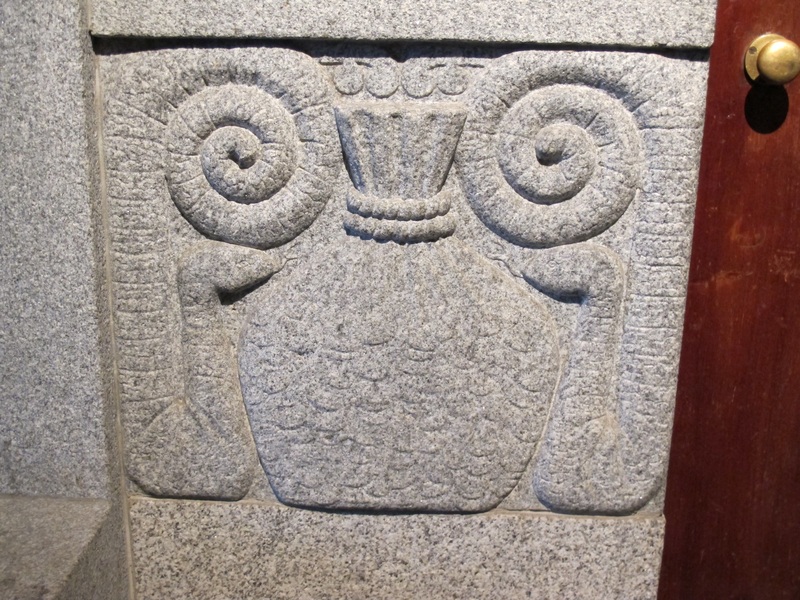 This is made obvious when you see the carvings at the entrance. 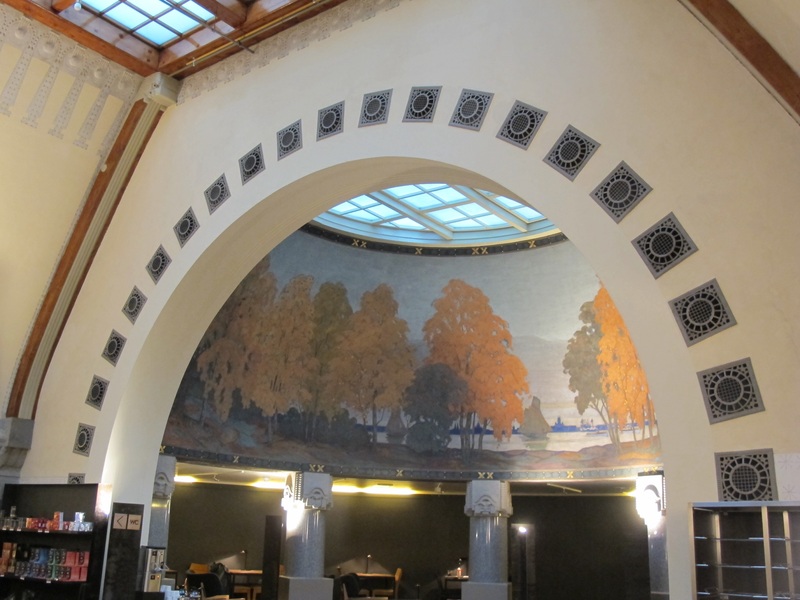 The banking hall has 3 naves and vaulted ceilings. 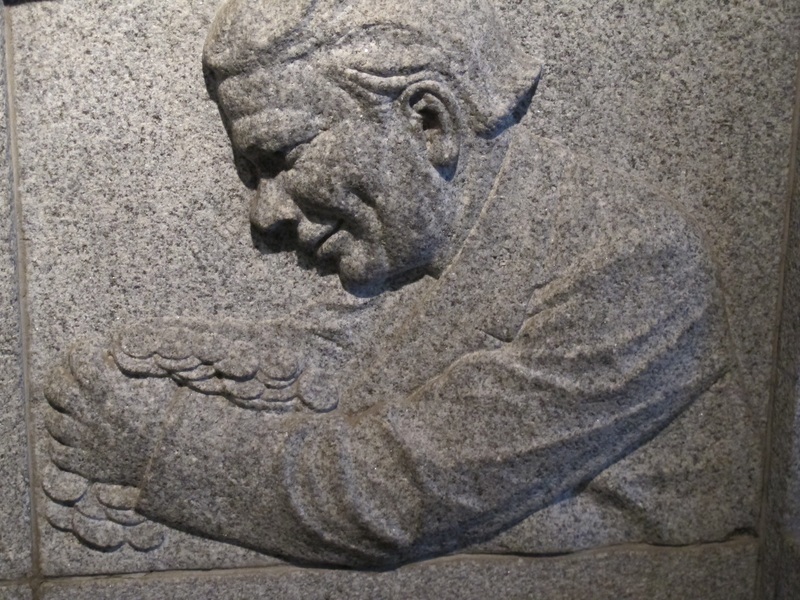 The rich ornamentation, decorative paintings and stone sculpture were designed by Walter Jung. 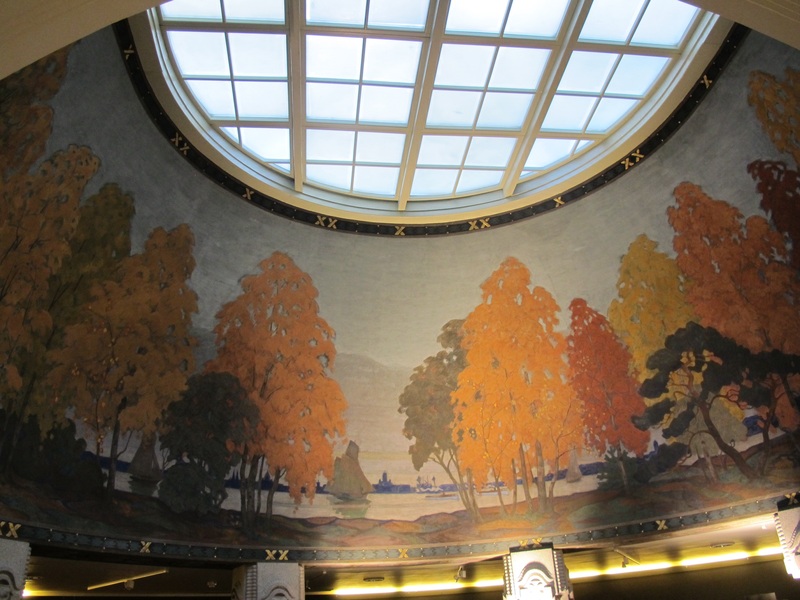 The beautiful painting in the domed section was done by Wilho Sjostrom in 1916. 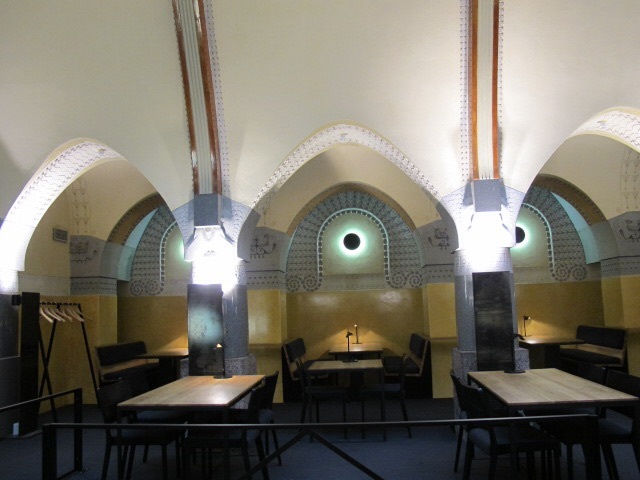 The interior is so beautiful the food almost takes second place, but there is a good selection and it is reasonably priced. There are outdoor tables in warm weather, but I can’t resist the lovely interior. 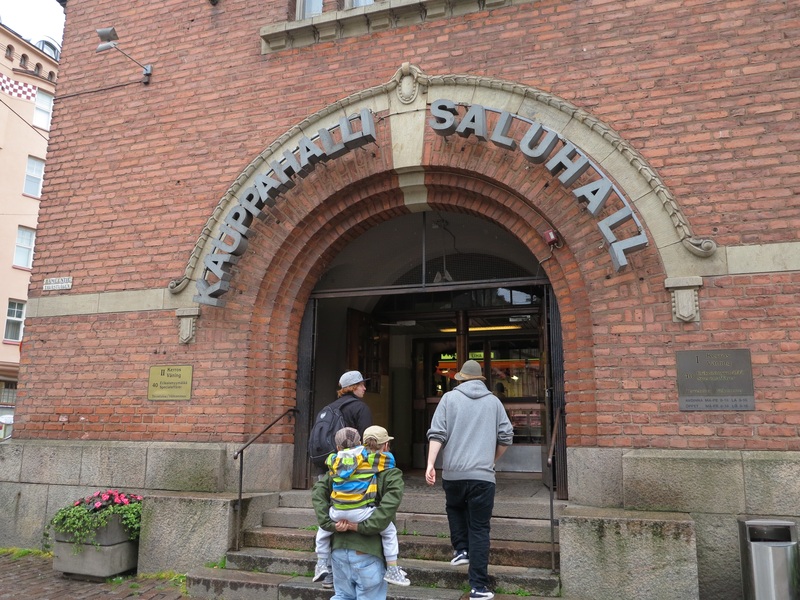 As well as the excellent covered market beside the harbour in Helsinki, there is a very good one just across the road from the Hakaniemi metro station…Hakaniemi Market Hall. It has about 70 shops on 2 floors. The shops on the first floor sell foodstuffs and the second floor has souvenirs and handicrafts. I didn’t get past the food. 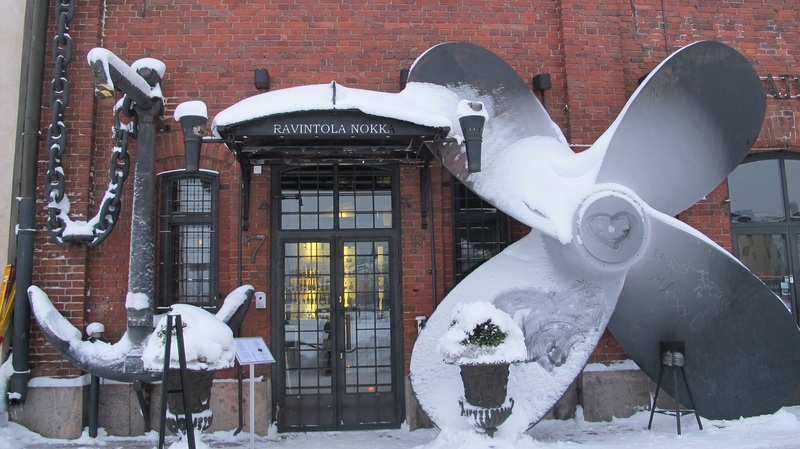 This is where Finns go to get really good fish and ecological vegetables. 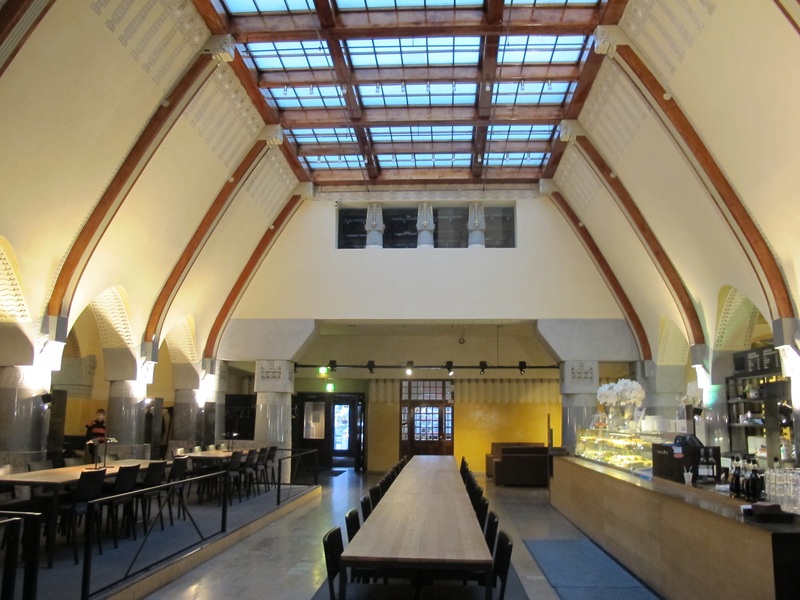 There are several cafeterias where it is possible to get great lunch. The market was designed by Karl Hard and opened in 1914. I have photographed the wonderful entrance to this restaurant several times, so I thought it was time to go inside to try their food. The restaurant was fully booked but there was a place for me in the bar area. 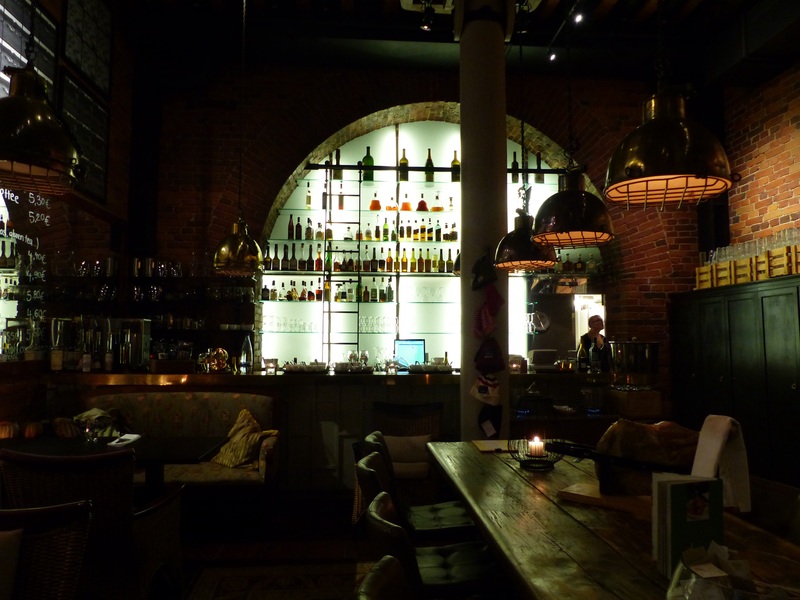 The friendly French waiter showed me to a seat right in front of the bar. 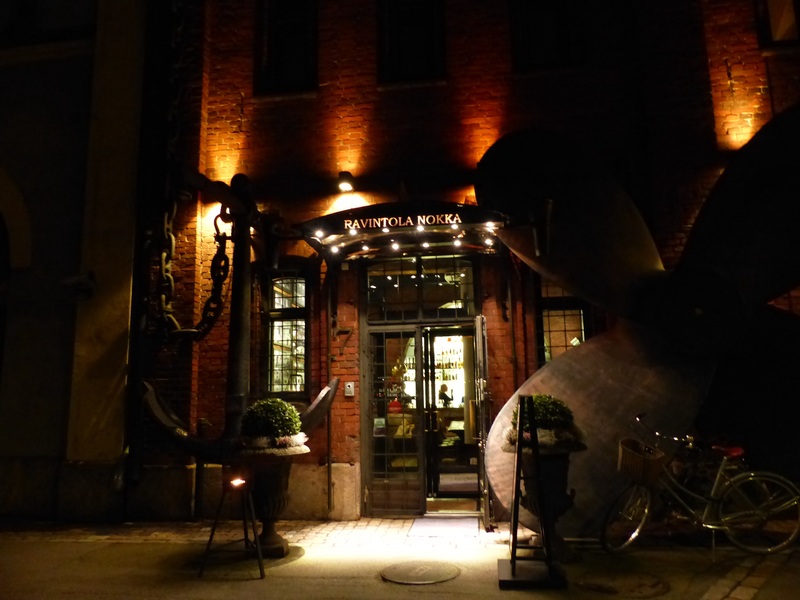 It is easy to see why Nokka is considered to be one of the top five restaurants in Helsinki. 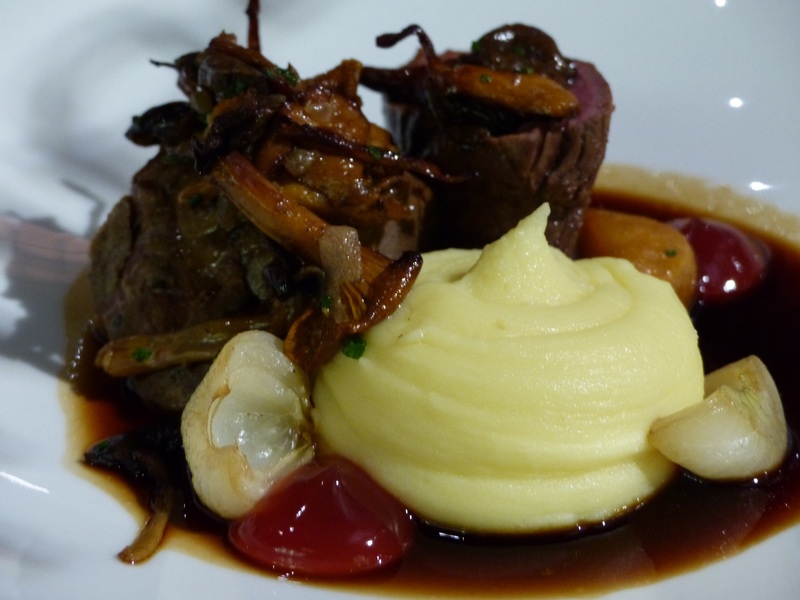 Chef Ari Ruoho loves pure ingredients. 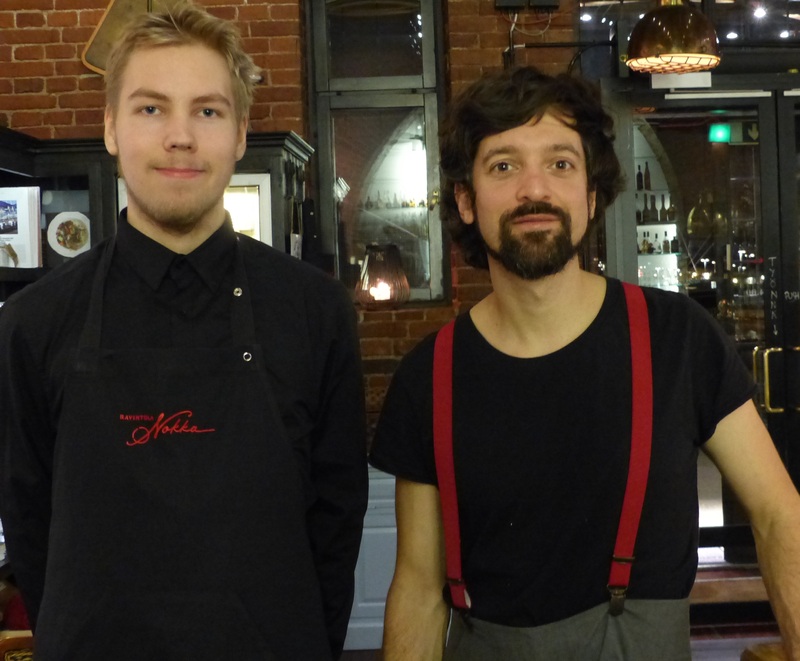 His produce is carefully sourced from the best producers from Finland. 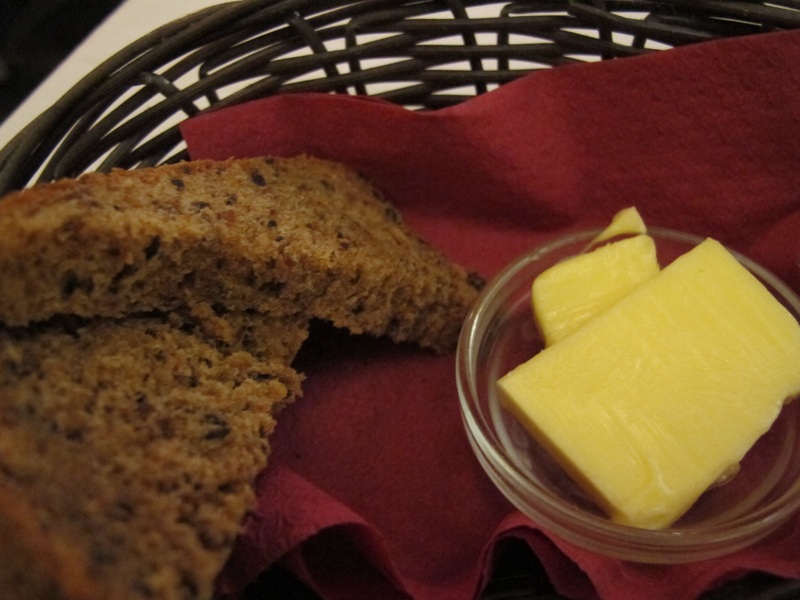 I love Finnish bread and Nokka’s was exceptionally good. 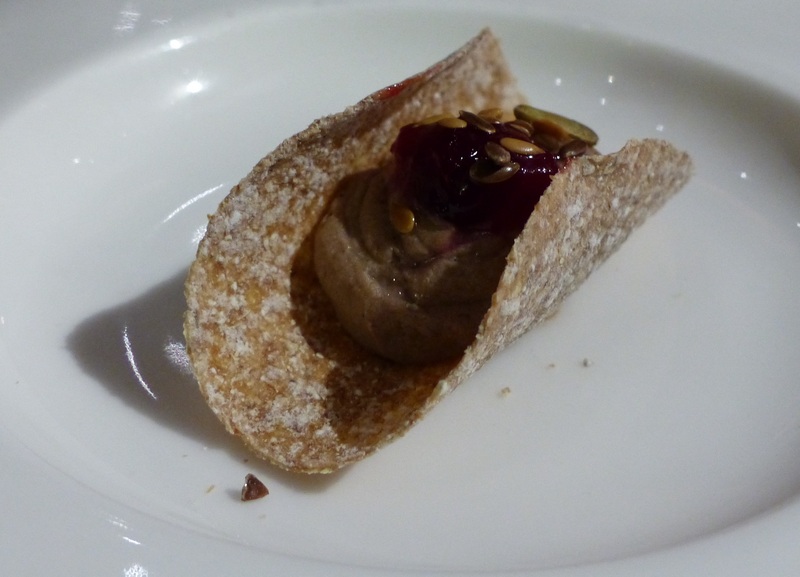 An amuse bouche appeared and the morsel of duck liver pate was very delicious. 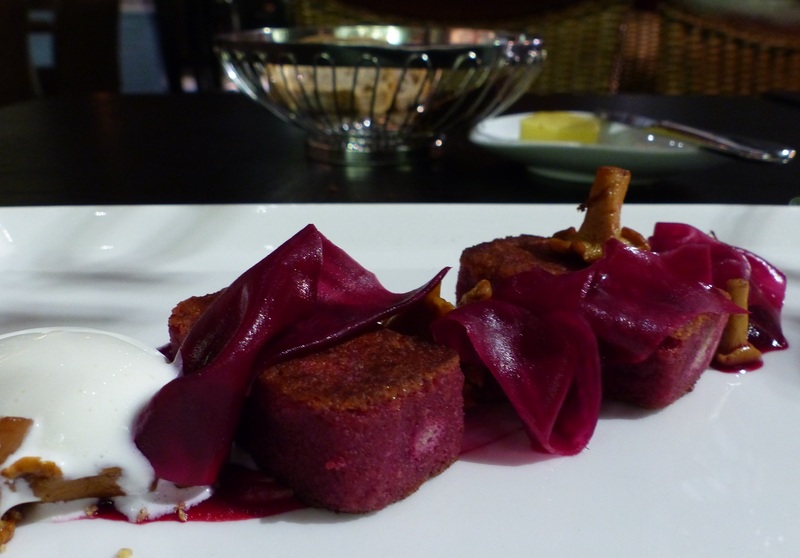 My first course was a beetroot bread pudding with slivers of pickled beetroot. 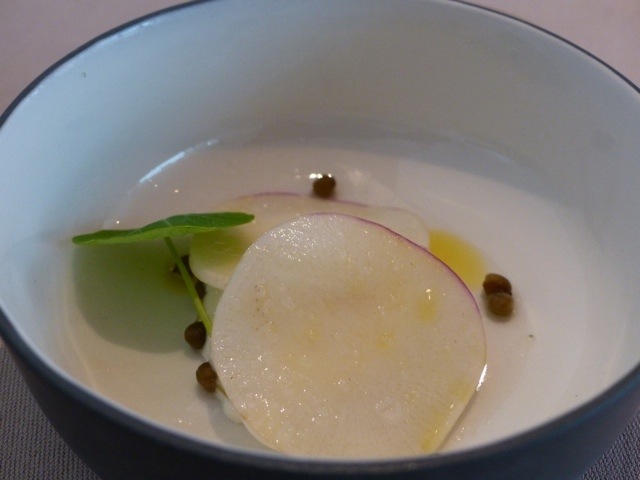 It was a very interesting and delicious take on one of my favourite vegetables. 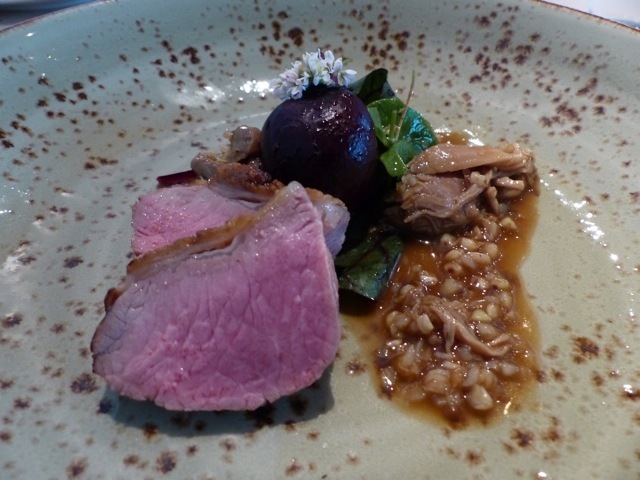 The reindeer was cooked to perfection for my second course. 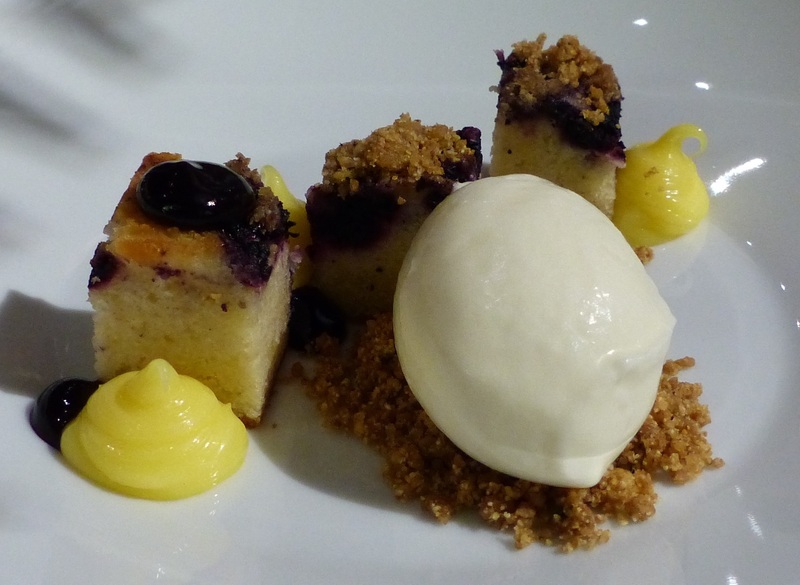 Dessert was heavenly…blueberry pie with cardomom ice cream. I will definitely be back to Nokka and hopefully there will be room for me in one of the gorgeous rooms inside the restaurant. All the staff members were friendly, efficient and helpful, especially these 2 lovely young men. Nokka is beside the harbour below the Russian church. 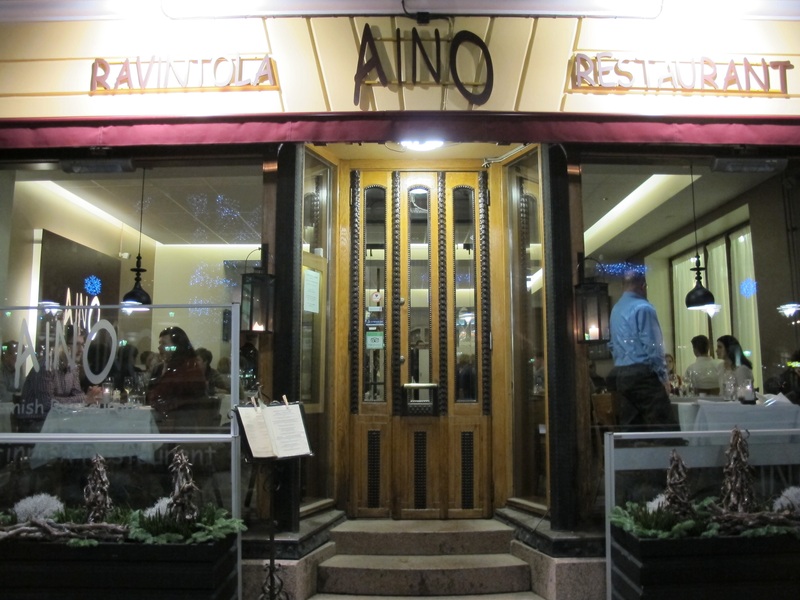 Aino is a traditional Finnish restaurant in Pohjoisesplanadi. I have eaten there several times and have always found the food to be delicious. The service is friendly and helpful. 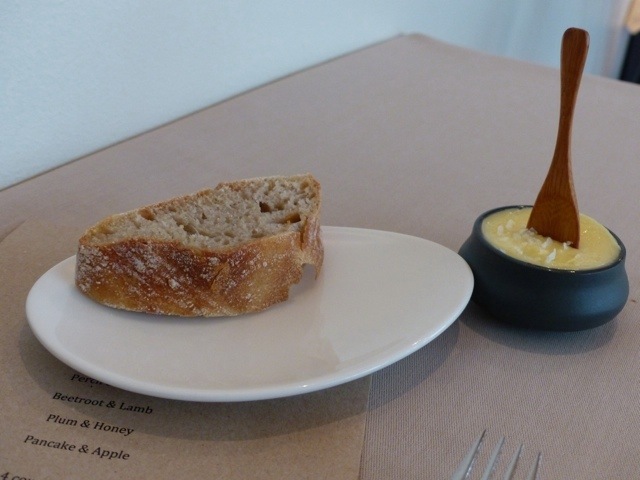 Their bread is baked on the premises and is very good. 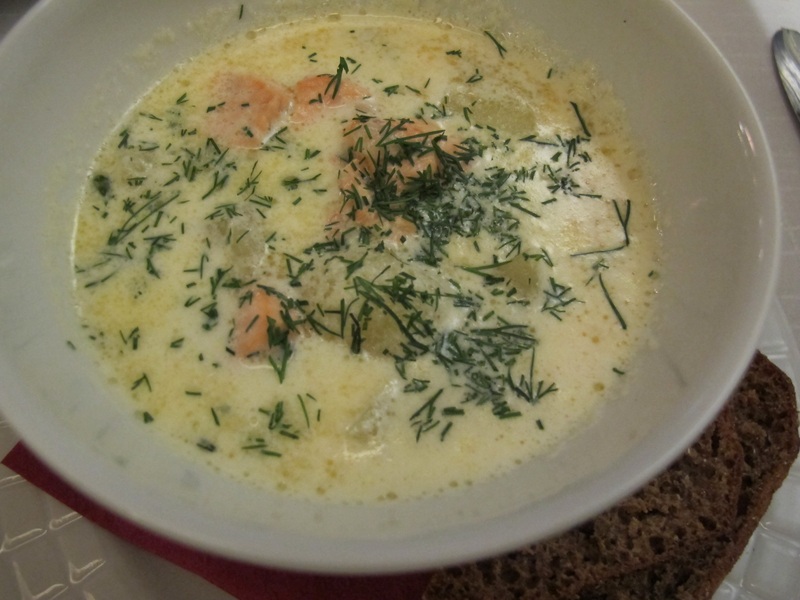 Salmon soup is a favourite of mine when I visit Helsinki. The salmon is also excellent. 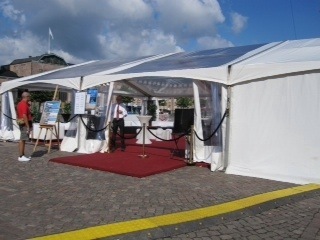 The location is excellent and the prices are reasonable. 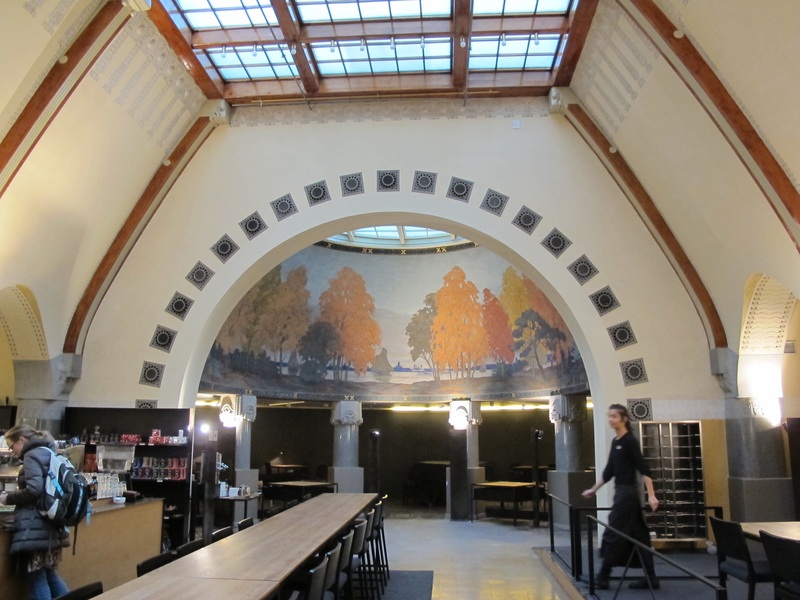 It is one of my regular places to eat when I am in Helsinki. 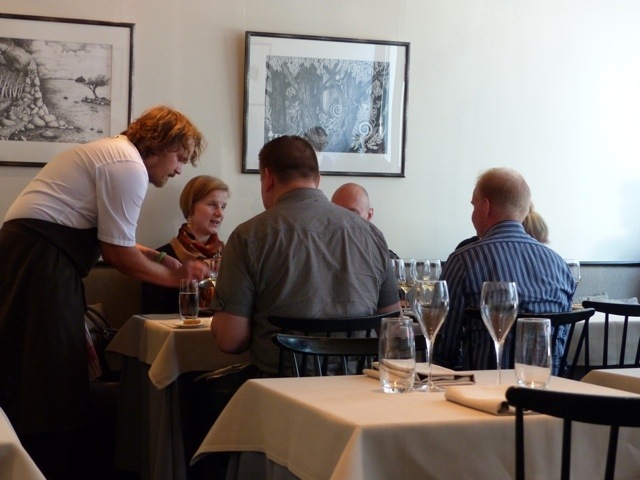 Ask is a small, intimate restaurant in the Kruununhaka area of Helsinki, not far from the back of Tuomiokirkko. 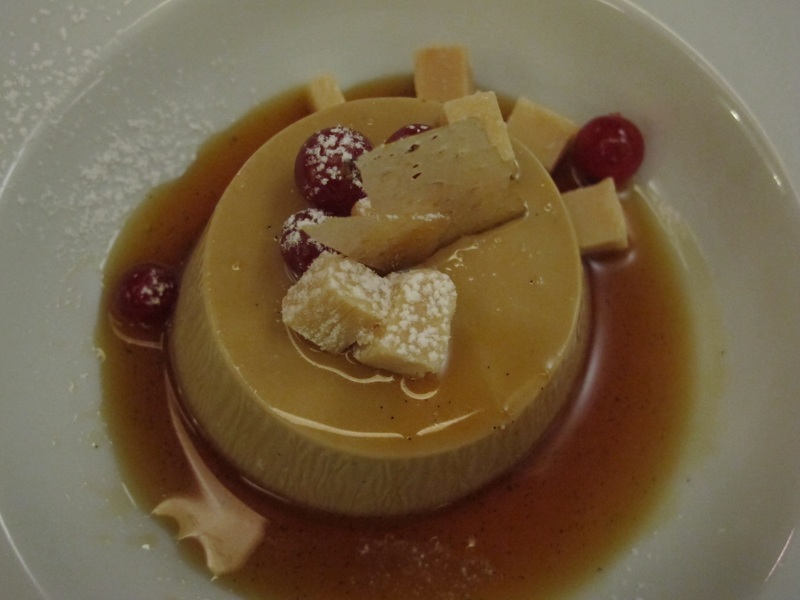 The restaurant offers 4 or 8 courses. 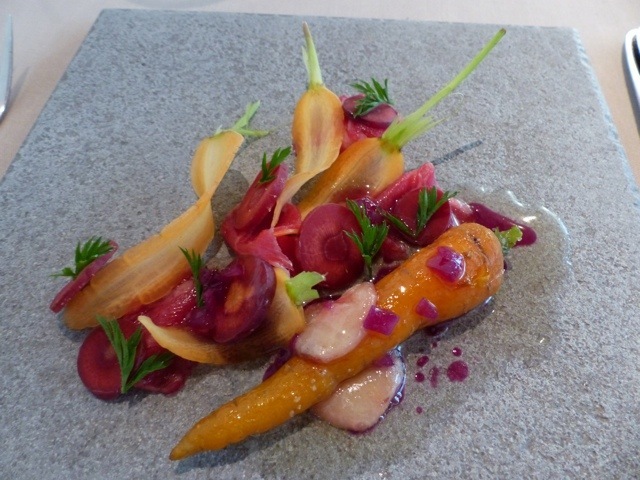 All produce is sourced from small farmers and producers and menus vary according to the availability of ingredients. The beverages are carefully selected to complement the food. 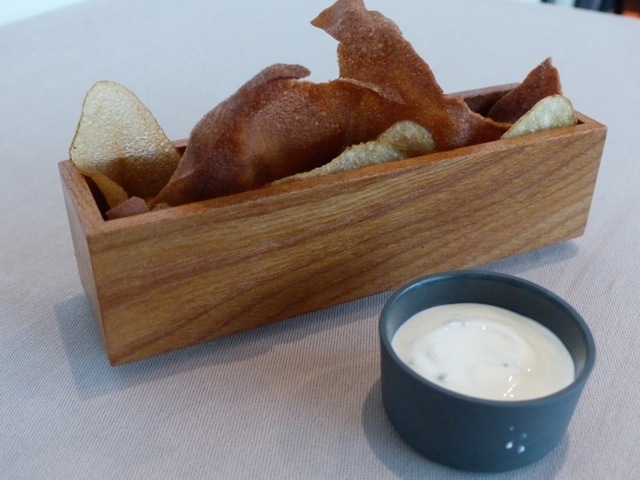 I chose the 4 course menu, but first to the table was the crunchy bread alternative, served with a delicious yoghurt. 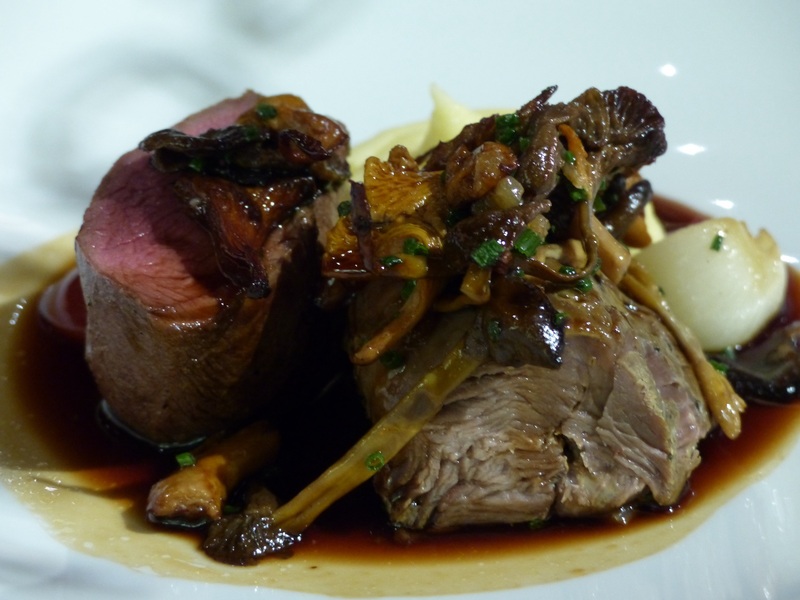 You are invited to choose between the 2 main courses then the chefs will select the others which will best suit your choice. I chose the lamb. 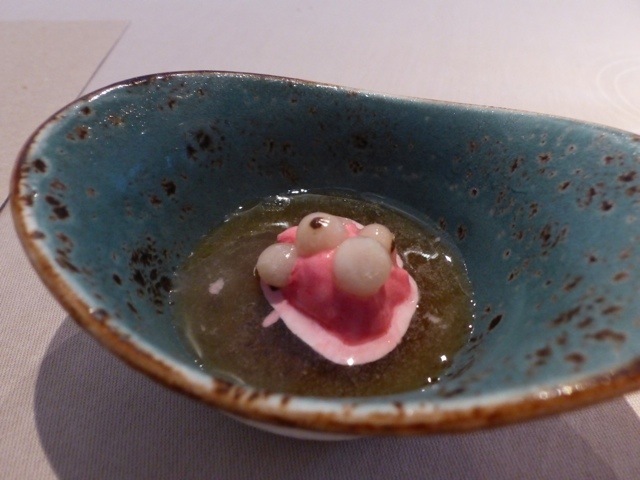 An amuse bouche was the next tasty treat to arrive. 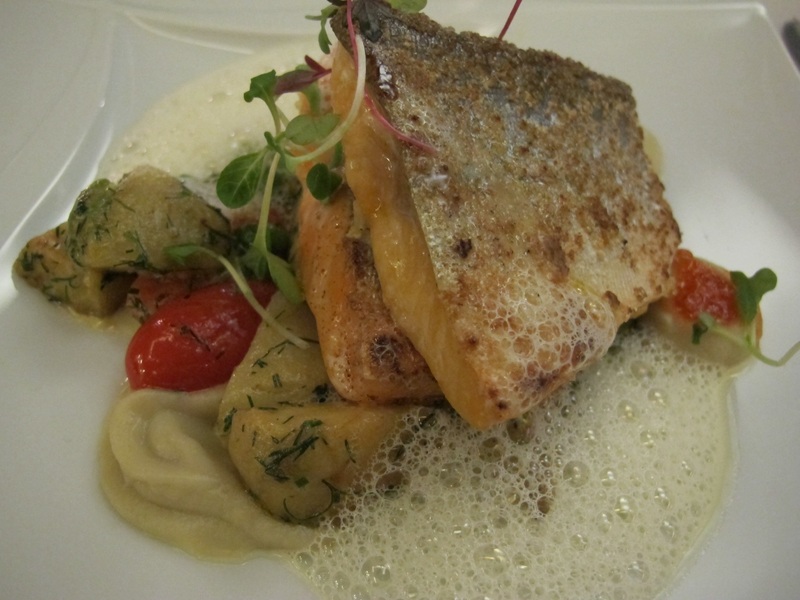 One of the chefs brings the food to the table to explain what you are about to eat. 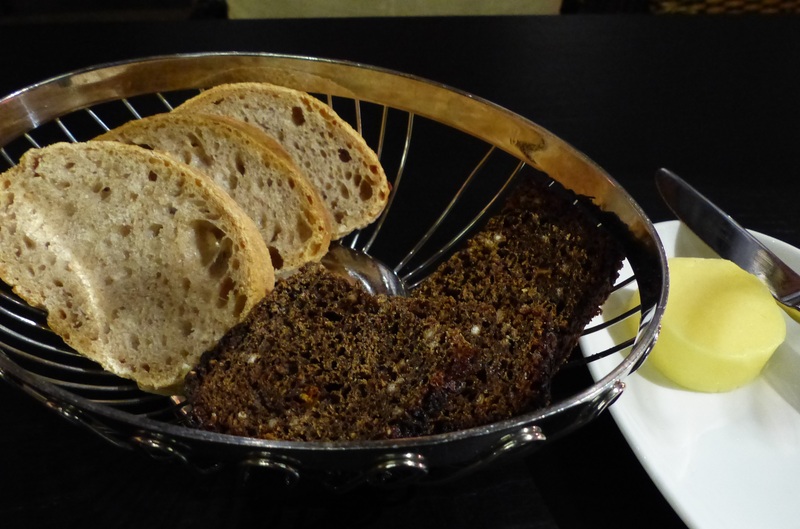 The heavenly bread is baked on the premises every day. Here are my scrumptious dishes. Before my dessert was a pre-dessert taste treat. 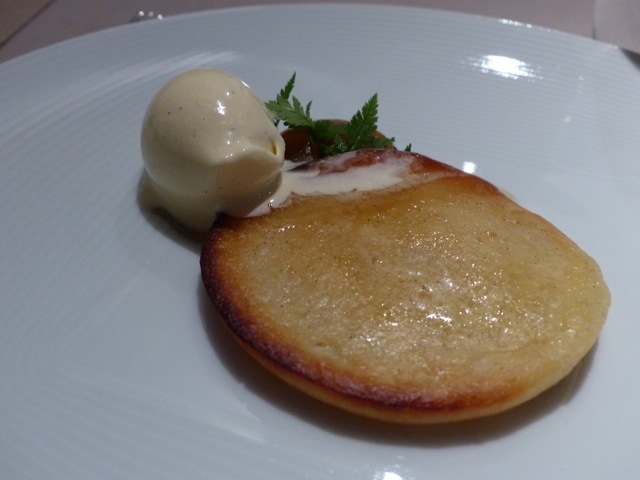 Then came the apple pancake. Normally there would be a different wine with each course, but I asked to have just one glass and they happily agreed to this. It was an excellent Umbrian Sangiovese. Ask seats only 26 people and I would suggest you book ahead. You can do this via the website. 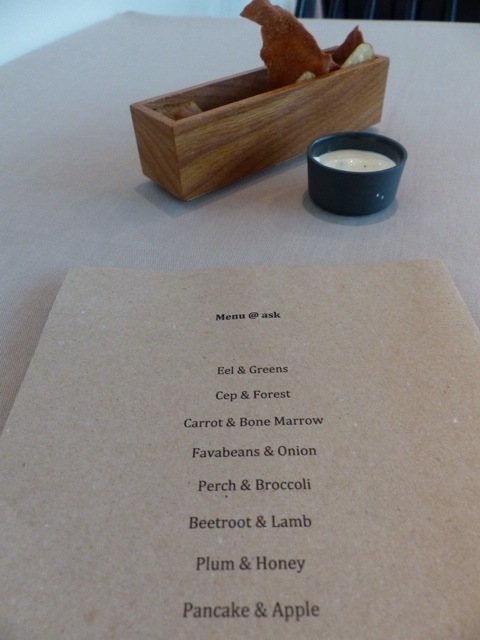 Ask has a Michelin star…well deserved. 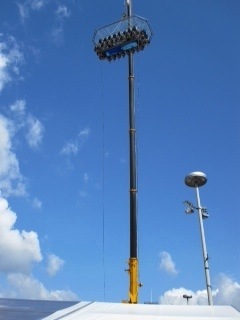 Today is the last day for Dinner in the Sky. 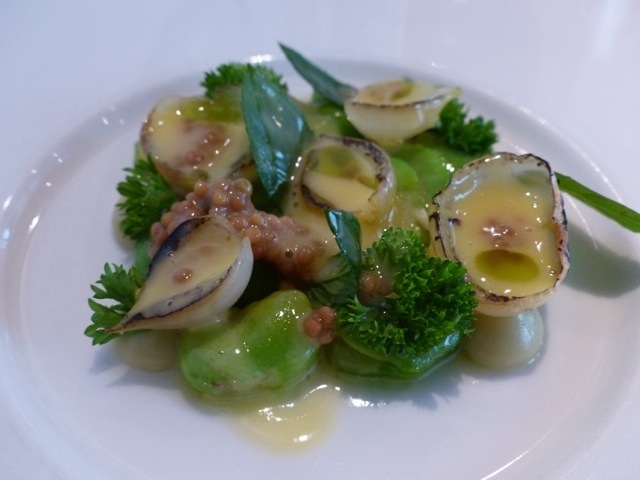 If you are in Helsinki right now you can have a delicious dinner with an incredible view over the city. Thank you to my friend Kirsi who is in Helsinki now and keeping me up to date with Helsinki happenings.